Mindfulness is easy to learn, involves only a small time commitment, and brings forth immediate, positive results. 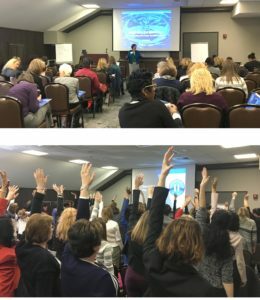 From keynote addresses and Mindfulness presentations, to full-day hands-on Mindfulness programs and multi-day seminars and Leadership Training sessions, Harriet customizes her deliverable to meet client needs. Harriet’s passion is helping individuals take that first step toward a healthier, more fulfilling life. Her programs and workshops teach people how to easily work with the many challenges they face every day. Attendees learn how to live healthier, more fulfilled lives. From one hour up to multi-days in length. Programs are customized for the needs of each client. Programs are given both privately and publicly. Each program is an open and honest conversation. Participants talk, laugh, relax, and breathe, and in the process, they learn how to live in the moment. A session can be conducted in an office, a conference room, or any location conducive for learning. Participants talk, laugh, relax, and in the process, they learn how to live in the moment. How to pay attention to your life during any situation (eating, working, spending time with family), and why doing so can result in peace of mind and better health.